We have already seen the importance of the Babingley River to the village during the earlier part of its history. By providing access to the sea, it provided a cheap and easy means of transport and a source of seafood. The river was also an important source of power for our Saxon and Norman ancestors, and continued to be used as such until the Upper Mill stopped grinding corn and animal feed in 1952. The Domesday Book records that the parishes of Castle Rising and Babingley shared at least five watermills, between the sea and the eastern part of the parish. All must have been upstream from that part of the river which was used for navigation. The Babingley River was one of the few rivers in West Norfolk suitable for milling. It was relatively fast flowing and larger than at present with a gentle gradient which made it possible to build low dams which provided a head of water. Leat streams, to divert part of the river’s flow to the mill wheel, could be easily dug in the soft glacial or alluvial deposits. Inventories taken in the 14th and 15th centuries mentioned five water mills used for both corn milling and fulling cloth and the sites of four of these can be identified today. Two of these sites continued to be used until the 19th and 20th centuries respectively and part of the mill buildings have survived. The Upper Mill, (now often but inaccurately referred to as West Newton Mill) is at the extreme east end of the parish, enclosed by an extension of the original Saxon parish boundary. 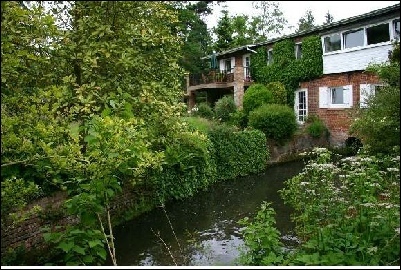 It is now an attractive private house but the mill pond and the water wheel have been preserved. Fig 1. The converted Upper Mill in the 21st century. The Lower Mill is in the wooded area north of the bypass. The large Mill House is a private residence which during World War II served as an officers’ mess. 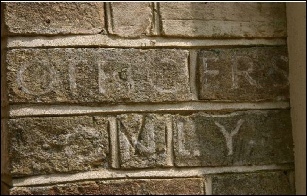 A faded reminder of this time can be seen in the inscription just visible near the doorway. 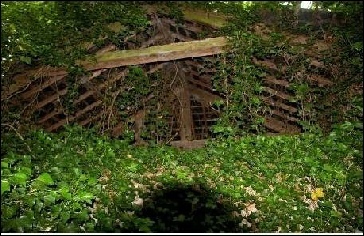 The mill itself is gone but parts of the ruined wheelhouse can still be seen (Fig 3). Fig. 3. Remains of Wheelhouse of Lower Mill. The position of two other early mills can be deduced from landscape and aerial photographs. One of these, which is mentioned in a 16th century document as having been recently abandoned was “unto a place where sometyme Babingley Myll did stand being west of the Stone bridge of Rysing a furlong and a half” The Stone bridge is the one on the Old Hunstanton Road. This fits exactly with the position indicated by the aerial photographs. The other mill site is 600m downstream from the Upper Mill at a point where the parish boundary narrows to include only the river and its immediate banks. It can be seen in the centre of the photograph (Fig 4) situated at a point where the straight side ditch, or leat, takes water from the river in a south westerly direction. Upstream from the site is a meander at the end of which mills were often located. The river has now been straightened but the former meander is still visible in the photograph. The parish boundary follows the line of the leat and this suggests that the mill was there prior to the establishment of the parish boundary in Saxon times. Fig. 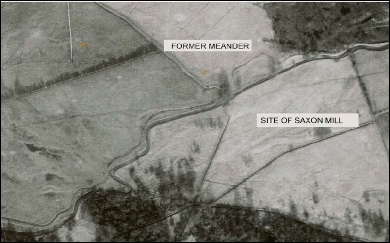 4 1946 Aerial photograph showing location of former Saxon Mill. There are many documents relating to the two existing mills. The Upper Mill was a Fulling Mill until 1691. Here rather loosely woven cloth was scoured, sometimes in urine then in water and fuller’s earth to remove the grease. It was then pounded with wooden mallets or stocks to consolidate the fibres. The stocks were powered by the water wheel. 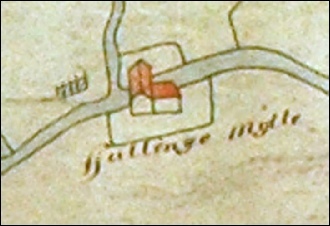 The 1588 Map shows not only the Upper Mill but also the tenter frames nearby, on which the cloth was eventually dried and stretched. Fig. 5 Upper Mill (ffullinge mylle) with tenter frames in 1588. After 1691 the mill was converted into a Paper Mill, the first one ever recorded in Norfolk. It seems likely that the initiative came from the new Lords of the Manor, the Howards of Ashtead. The raw material for paper making at that time was rags which having been stripped of buttons and clasps etc were cut up, soaked and washed and then pounded by wooden mallets into a pulp from which the paper was made. The sheets of paper were usually hung to dry in drying sheds at a distance from the mill because of the danger of fire. Fire in fact was a problem but in the form of arson when in 1722 the miller from the Lower Corn Mill, on finding that the paper mill was also grinding corn, burnt it down. He was “committed to the castel”. The mill was rebuilt in 1746 for the miller John Parrott and all went well for a while until Parrott, perhaps as the result of an illness began to threaten the life of William Fawssett, the agent for the estate, who was responsible for collecting the annual rent. Colin Dence wrote about “The mad and frantic miller” in his book on Castle Rising. Despite these setbacks the mill continued to make paper until the 1847 by which time wood pulp and esparto grass were being used for paper making and modern mills were built near to ports. The Upper Mill was then converted into a corn mill and worked as such for almost a hundred years until it closed in the 1950s. William Rye and his son Jimmy were the last millers and some of the older residents of the village remember taking grain, which they had gleaned from the fields, to be ground at the mill. After being empty for some time the upper storey of the mill was removed and the mill was converted into a residence. Fig 6. 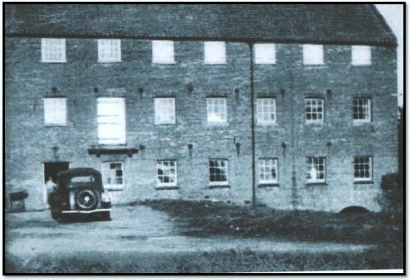 The three storey Upper Mill in 1950. The Lower Mill was also active since Saxon times but always as a corn mill, grinding corn into flour for an area much wider than the village. Certainly since the nineteenth century the miller here was also a farmer and the buildings adjacent to the mill included barns and stables, piggeries and bullock sheds. Occasionally the lessee was also a brewer. In 1761 William Cooper not only leased the Lower Mill and adjacent farmland, but also two of the drinking establishments in the village – The Bull and the Blue Parlour. The mill seems to have been very successful. The Ayre family, millers from 1822-1867 certainly lived well. In 1861 they employed twenty men as millers, waggoners, carters and farm labourers as well as having four servants and a governess in their house. They leased the mill from the Howard estate and the mill house was greatly extended in 1846 into a very elegant home for them. Perhaps they overstretched their income too because in 1867 the family firm was declared bankrupt and their goods were sold at auction. The mill itself continued in business for other twenty or so years and in 1881 there was a community of over forty people living in the mill and adjacent mill cottages. Fig 7. Lower Mill House. This frontage was built in 1846. By 1891, probably suffering from the completion of large modern coastal mills using imported corn, the mill and the farm ceased to function. The river was diverted, the mill pond drained, the wheel house bricked up and the mill pulled down. The farm buildings have since fallen into disrepair. 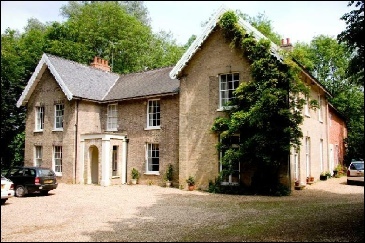 The Mill House and cottages remain tucked away in the woods beside the Babingley River beyond the by-pass. The map below shows the two mills along the Babingley River as they were in 1868, shortly before the Lower Mill closed down. Fig 8. Map of the Upper and Lower Mills in 1868. There is a nice walk by public footpath between a point close to the bridge near the Upper Mill and the village which passes the Lower Mill cottages.